The Taurus 709 Slim looks and feels exactly like the name gives away. 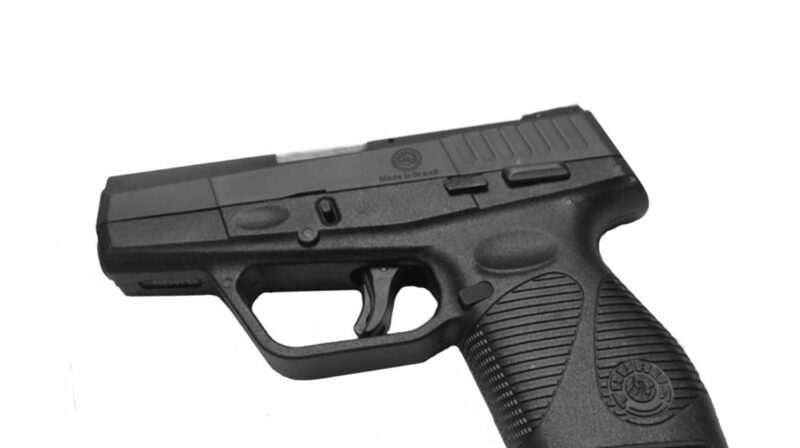 Taurus responded to consumers, and they produced a subcompact 9mm pistol that was smooth, sleek, and “slim” enough to avoid showing bulky lines or lumps. It’s an excellent pistol to conceal for self defensive purposes, but you’re going to need a good holster to go with it, then. We’ve put together a review of the best Taurus 709 Slim holsters on the market, and we’ll let you know which was our favorite at the end. Since the Taurus 709 Slim is so compact (the whole thing is barely six inches long), a lot of holsters that we would normally pass up actually accommodate this pistol very well. That doesn’t mean we’re showing you the cheap stuff that will fall apart on you, but you could be surprisingly happy with a holster that is significantly less in cost than what you’re used to purchasing. We chose an assortment of both inside the waistband and outside the waistband holsters for this review; even though the Taurus will mainly be used for concealed carry, it’s very easy to hide this little guy on the hip under a thick shirt. Materials – The Barsony belt holster may not be the most ideal for concealed carry, but it is very discrete and easy to conceal under a shirt. 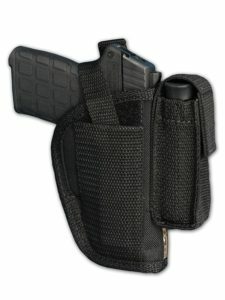 The exterior of the holster is made of an all black Cordura nylon material. The inside of the holster is made of a waterproof, closed cell foam padding, which is then lined with a smoother nylon fabric. There is a belt clip attached for wearing on a 1.5 inch wide belt. Included on the OWB holster is a nylon retention strap, which closes with Velcro, and a nylon magazine pouch (also with a Velcro closure). Performance – For many of our reviews, we’ve passed up holsters likes this Barsony OWB holster because, for most pistols, it would be too flimsy or lightweight to be an effective or protective option. 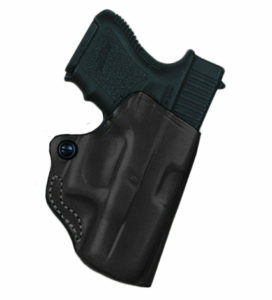 However, for the Taurus 709 Slim, you can actually get away with a holster like this. The waterproof foam padding is a big plus here, as well. In many cases, being made of mostly nylon would not do the trick. For some, this may still not be a viable option, but the Taurus is so compact that it may almost feel like you have nothing at all attached to your side. Nylon won’t be so resistant to outside elements, but it’s easily washable and repairable. What we say – This outside the waistband holster for your Taurus 709 Slim is the best choice for either those on a low budget or who truly want to maintain the light weight and convenience of a subcompact pistol. Outside the Waistband Carry Belt Holster makes a steady platform for drawing and re-holstering gun; belt clip allows wear on trouser belt or holster belt up to 1.75" wide. Adjustable thumb-break retention strap protected by Strap Trap that covers Velcro adjustment. Materials – This inside the waistband holster by OutBags is constructed of all genuine leather. It has been hand dyed to maintain the fine material, and it has been treated with a clear coating to create a protective and resistant exterior. The inside of the holster remains soft to allow for a smooth draw and an easy re-holstering. This option can be purchased for left handed or right handed shooters, and it comes with a single, metal belt clip to secure to the waist. The muzzle is open ended. Although there are no retention screws, there is tight stitching around the trigger guard that offers retention and a slight molding to the leather. There is an additional leather strap at the top of the holster and at the belt clip to reinforce the integrity and structure. Performance – We have similar feelings about this OutBags leather holster like we do about the first option: we would pass this choice up in many cases, but it is a surprisingly good fit for the Taurus 709 Slim. While the leather has been treated to have a protective coating, it’s still on the softer side. It’s comfortable enough to wear inside the waistband, and it doesn’t really need a “tough exterior” to hold a small subcompact pistol. We would like the belt clip to be stronger or adjustable, but this isn’t a must for everyone. It’s another low cost option that would do just fine for most gunowners. What we say – This is the best Taurus 709 Slim holster for anybody who wants a more protective and durable holster than a nylon one and is also looking for an inside the waistband option. Materials – Another inside the waistband holster, the Fobus hybrid holster is made of multiple components. The back paddle is constructed of a flexible material that hugs the curves of the wearer’s waist while also absorbing the retention against the back of your Taurus 709 Slim. It also has multiple ventilation holes to avoid sweat building up underneath it. The holster itself is molded to the shape of your handgun and left open ended. It has reinforced stitching around the trigger guard as well as along the barrel. There are two belt clips attached, so the weight of your Taurus is evenly distributed across the back paddle. Performance – Our favorite part of the Fobus Inside the Waistband Holster is the back panel. While it does serve as a sweat guard, it also ventilates heat from the body. This means you could wear it all day without your body temperature rising. Even though the whole thing will be pretty small, you’d be surprised how quickly sweat can build up behind your pistol. Our one complaint with this option is that, despite the look of it, the retention is not adjustable. You can’t adjust the cant or height of the holster either. For a subcompact, this may not be a deal breaker, but it may leave some feeling disappointed. 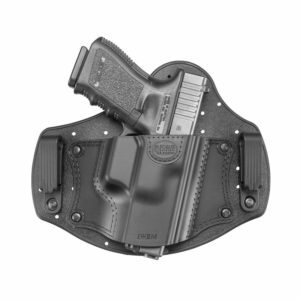 What we say – This inside the waistband holster for your Taurus 709 Slim is the best option for those whole want more tension distribution across the body and are looking for a sweat guard. Fobus IWB Inside The Waist Band Holster, right handed. Materials – The DeSantis Mini Scabbard is an outside the waistband holster that can be purchased in black or tan. 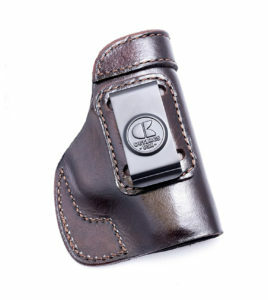 The material it’s made of is entirely leather, and it has been molded specifically to the shape of your Taurus 709 Slim. The muzzle of this option is closed for a tight fit. There is a specially designed stitching pattern under the trigger guard, as well as an adjustable screw, for increased retention. A single belt clip is attached to the holster, offering a forward cant. This option is available for left handed or right handed shooters in either color. Performance – DeSantis hit it right on the mark of what many with a Taurus 709 Slim are looking for: discrete, minimalist, and easy to conceal. The leather is highly molded, and it hardly adds any extra bulk to your hip. Despite not being an inside the waistband option, it really won’t be very noticeable, especially once it’s under a shirt. Although the cant is not adjustable, you won’t have to worry about your pistol rocking or sliding anywhere. For some, the level of retention might actually be too much. It sometimes requires an extra hand to properly holster your weapon or to smoothly draw, but we’re talking about an extra second of manipulating the holster. What we say – The DeSantis Mini Scabbard is sleek and conforming. It’s the best choice for those who aren’t interested in an inside the waistband holster but still want a very low profile. Belt Fit: up to 1.5"
Our favorite holster for the Taurus 709 Slim was ultimately the last option in this review: the DeSantis Mini Scabbard. To put it quite simply, this option was made with the highest quality. Between the leather material used and the manufacturing, you almost can’t go wrong with selecting this one for yourself. While obviously most gunowners are using their Taurus 709 Slim for self defense and concealed carry, we recognize that this DeSantis holster is not an inside the waistband choice. Although it is for wearing outside the waistband, it is so well conformed to the pistol, that it’s almost unnoticeable once it is tucked under a shirt or jacket. The tighter retention makes it safe to wear on the outside of your body without worrying about it bumping up against something or having your pistol get knocked around. 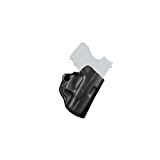 Some may even agree with us that wearing a subcompact pistol inside the waist will make it easier to slide free, so we think everyone should consider this holster from DeSantis.